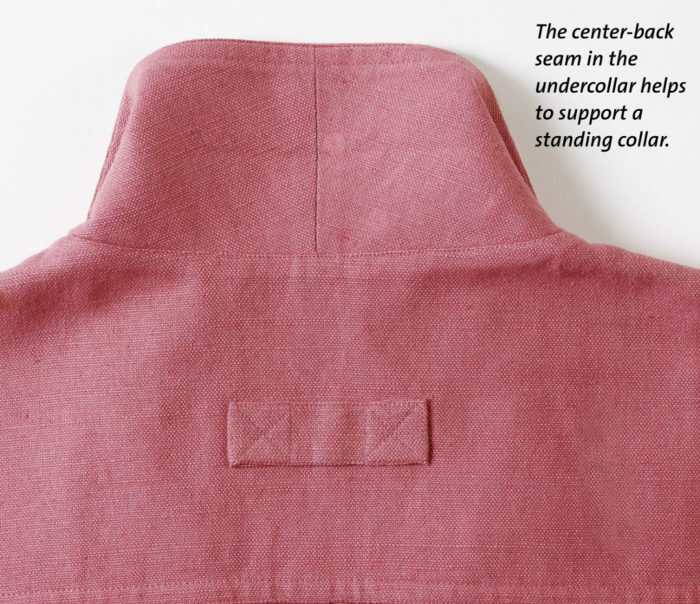 Contributing editor, Louise Cutting, shares a great technique to smooth away a collar’s bulky points and edges from “A Better Collar” in Threads issue #166. The secret is in reworking the collar pattern piece to shift the front edge seams, thus eliminating the stiffness and lumps these seams cause. This altered version works well if you like to wear collars standing up (which puts more color around your face and makes your neck look longer). The collar stays where you place it because this technique puts the undercollar on the bias. This easy-to-follow tutorial will leave you with the perfect collar! The revised collar pattern for this technique starts with the original collar pattern. It can come as one piece cut on a fold or as two pieces-the upper collar and undercollar; follow the same directions for both. 1. Start with a half-collar pattern piece. 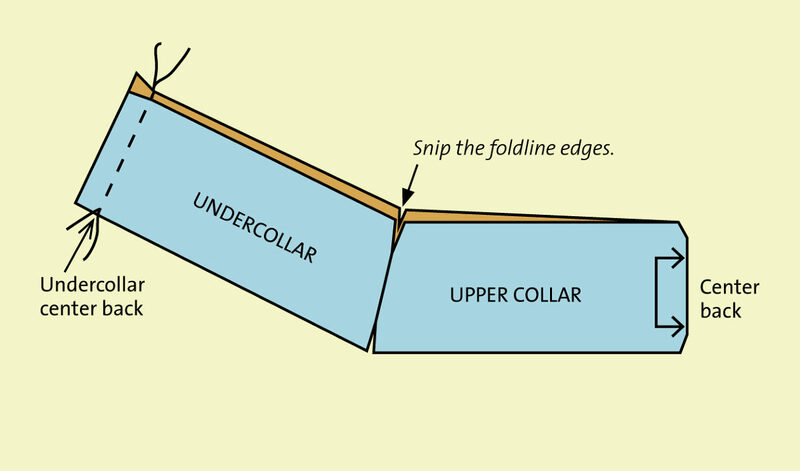 Usually a collar pattern instructs to cut two on the fold. This example shows a typical half-collar pattern, with the center back placed on the fold. With the collar pattern wrong side up, copy the collar shape to tracing paper. If the seamlines aren’t included on the pattern, draw them on. If your copier prints at 100 percent, you can also photocopy the collar pattern, but make sure the collar pattern is placed wrong side up in the copier. You now have two halfcollar pieces, one for the upper collar and one for the undercollar. 2. Add a 5⁄8-inch-wide seam allowance to the undercollar pattern piece’s center back. Extend the seam allowance from the center-back line. 3. Tape the upper-and undercollar pieces together, aligning the short front seamlines. Overlap the collar pattern piece along the seamlines drawn in step 2. Label these seamlines as foldlines. The little points at the ends of the collar may stick out beyond the cutting line on the outside collar edge. These points are not needed and may be cut off. The angle of the collar’s front edge varies between patterns; consequently, the drafted one-piece collar shape also varies. Cut one pattern piece on the fabric’s fold. This new pattern piece combines the upper- and undercollar pattern pieces and puts the undercollar off grain because the pattern tilts up. 1. Mark the front foldlines. Make a 1⁄8-inch-long snip at both ends of each foldline for the front edges. Also snip the center back on both edges of the upper collar. 2. Interface the entire collar. Because there is no longer a seam at the front edge of the collar, the upper-and undercollar are interfaced as one piece. Be careful not to stretch the off-grain undercollar. Offgrain fabric pieces are easily distorted. Place the collar on the ironing board, wrong side up. Place the tissue pattern piece on top of the fabric, matching the center-back foldline. Align the fabric so it matches the tissue pattern exactly. If the fashion fabric shape doesn’t match the pattern, it usually won’t fit the neck edge or collar band properly. Apply a very lightweight fusible interfacing to the entire piece. 3. Fold the collar piece in half with right sides together, aligning the short raw edges. Stitch the short ends with a 5⁄8-inch-wide seam allowance. Trim the seam allowances to 1⁄4-inch and press open. This is the undercollar center-back seam. 4. Refold the collar. This time, fold on the 1⁄8-inch snipped edges to align the center-back seamline and the center-back foldline. Sew the collar’s outer edges together with a 5⁄8-inch seam allowance. Trim the seam allowances to 1⁄4-inch, and clip diagonally across the points. Press this seam open over a point presser. Turn the collar right side out using a point turner. 5. Press. Working with the undercollar right side up, favor the long outer edge seamline to the undercollar; the long collar seam won’t be visible from the upper collar once pressed. 6. Trim the neckline edges. 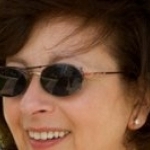 The unsewn neckline edges of the collar rarely match at this point; the undercollar has a tendency to extend beyond the upper collar. Trim the undercollar to match the edge of the upper collar. Wow! This looks like a "keeper"! I can't wait to try this out. I saw Louisa Cutting show this on Martha Pullen shows and when I make a stand up collar I will probably use this method of doing the collar. I have tried it and it works like a charm. Such a simple solution for those bulky front edges ! 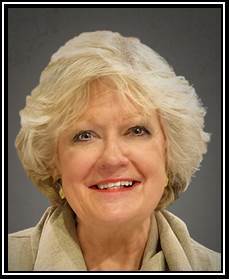 Thank you Louise Cutting ! I tried this when I first saw it demostrated on the Industry Insider Techniques DVD. This way of doing the collar is awesome. Try it you will get the best collar ever!!! Learned this in one of Louise's certification programs and it is the best technique. Would recommend her program to everyone. Nice application. I learned it years ago from Nancy Zieman of Nancy's Notions. It was in a couple of her books. But it's been quite a while & a very good way to reduce bulk. Thanks for reminding us all about this application of the collar pattern splitting. Just made a shirt to try out the technique and I'm very pleased with the result. Excellent! I planning to make a few button down blouses this season. This will come in handy. It's also illustrated in Sandra Betzina's tool kit. I can see at least one other benefit of doing the collar this way. The center seam on the under collar helps support the back of the collar to help it stand up better! But I also have a question: How does this change of grain work on the under collar? Does it stitch up the same? No problems with the bias? How to sew the collar: The upper collar needs to be placed toward the presser foot and the under collar is on the feed dogs. 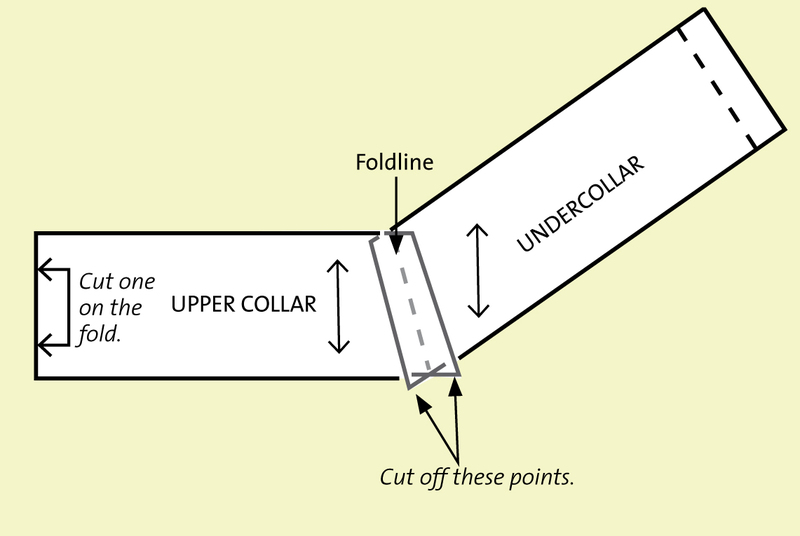 The under collar is off grain or can be even a full bias depending on the design of the original collar style. Off grain or bias sections of garments sew better when placed toward the feed dogs. The feed dogs will ease the bias, while the presserfoot 'pushes' the fabric ever so slightly...the end of the seam will come out even. Sewing the collar this way will keep the front points from curling. Don't forget to trim the seam, clip the corners, and press the seam open over a point presser/clapper before turning the collar right side out. Terrific idea! I'll make another shirt just to try it. I had just about given up on shirts after my last one. Thanks. I used Louise's technique on the last blouse I made - FABULOUS! I learned this technique from Nancy Zieman and I am glad it is being used again. Its a shame pattern companies can't do this in the beginning. This is very clever.